The officer rescued a turtle in the Hampton bays. Southampton, NY - September 8, 2014 - The Suffolk County SPCA issued a statement today praising Southampton town Police Officer Metcalf for his heroic work in rescuing a turtle in Hampton Bays. 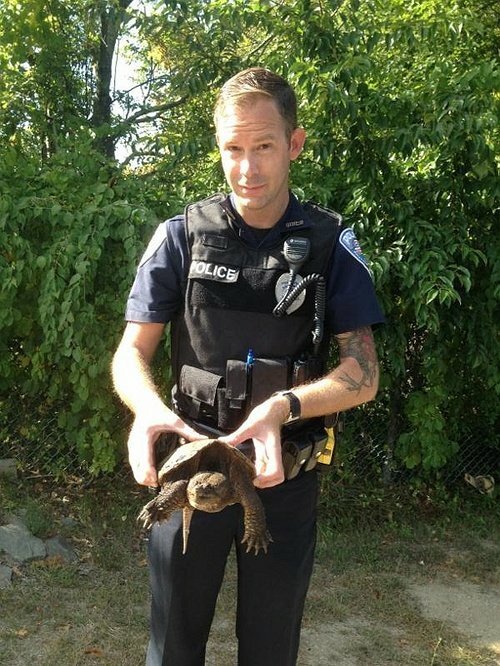 Roy Gross, Chief of the Suffolk County SPCA said that the snapping turtle was crossing Montauk Highway near Munn's Pond County Park at about 4pm yesterday when Officer Metcalf noticed it and positioned his patrol car so the turtle wouldn't get run over. Gross said that P.O. Metcalf walked up to the turtle, which is very dangerous and poses a fierce biting threat to humans, and picked it up with his bare hands. Officer Metcalf walked the turtle into the county preserve and placed it back into its natural environment. Chief Gross said that Officer Metcalf should be praised for his heroic actions in saving the life of the turtle. Subject: LongIsland.com - Your Name sent you Article details of "Suffolk County SPCA Praises Southampton Town Police Officer"